Rehearsals, Upcoming & Past Events. 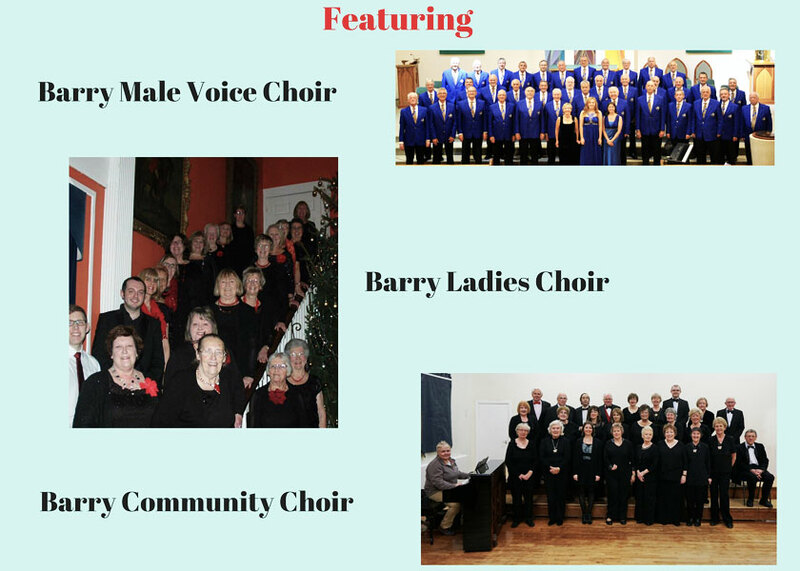 Barry Community Choir have a full season of concerts and events running throughout the year. Every Wednesday, 7.30pm to 9.30pm. 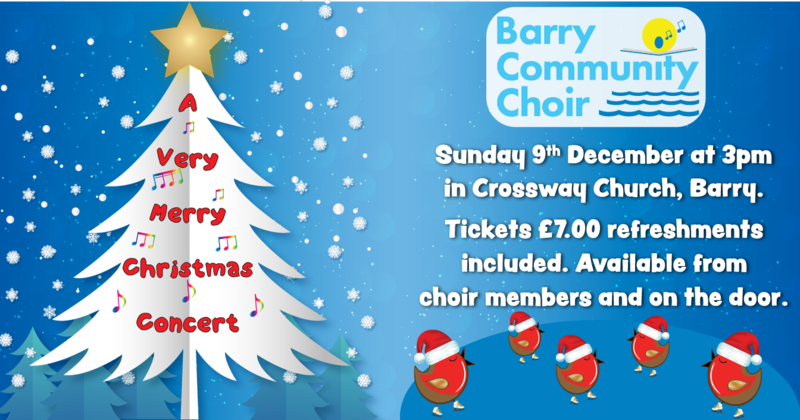 We are one of the biggest mixed choirs in Barry and are eager to welcome new members. So if you’re interested in joining us just pop along to the rehearsals on a Wednesday evening where a warm welcome awaits you. Thursday, 21st February 2019 at 7pm. The Mayor of Barry has organised a concert to support her local charities. 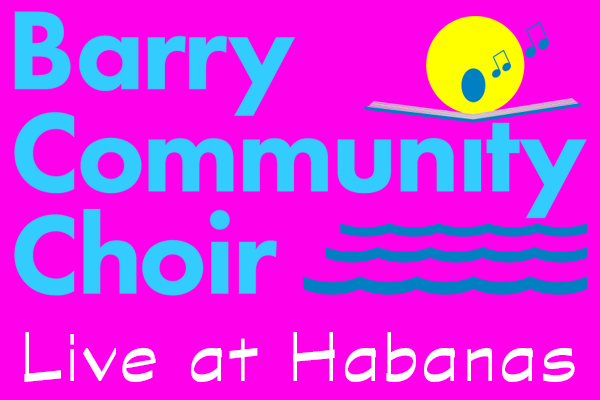 The concert will feature Barry Community Choir and Barry Brass Band on Thursday, 21st February, 2019 from 7pm. No need to purchase tickets in advance – everyone welcome! Jingle all the way and keep those winter blues at bay. Come out of the cold and into our warm and friendly concert. Enjoy listening to the Choir singing songs old and new – we’d love you to join in as well. We will be singing some traditional Christmas songs together with some toe-tapping lively new ones – and some favourites but with a bit of a twist! We’re not giving the surprise away until we see you! Whatever your taste – traditional or modern – you are assured of a warm, Christmassy welcome, coupled with lots of festive nibbles and a grand raffle. Tickets are £7 per person and include festive refreshments. Children aged 16 and under are free. Tickets can be purchased before the concert by email, from Choir members – or on the door. “Celebrating 50 years of singing! 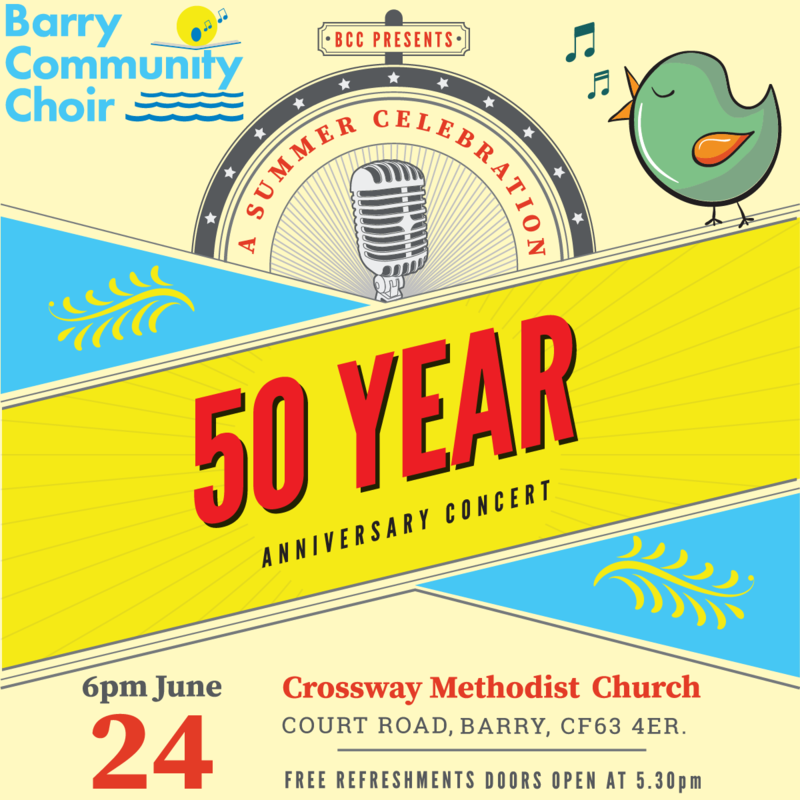 Barry community choir are holding a celebration concert on Sunday, June 24th to mark the 50th anniversary of its formation in 1968. Come and join us to celebrate the 50 golden years of this fabulous choir. Tickets are £6 for adults with free entry for children price includes refreshments. Where do You sing? 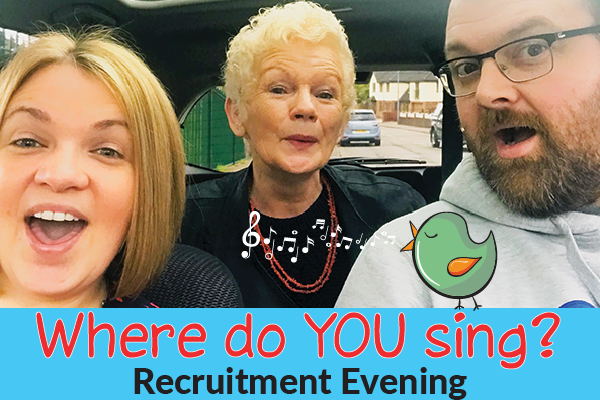 Barry Community Choir's Recruitment Evening. Where do YOU sing? Do you love a singalong in the shower or belting out a tune in the car? Why not give singing in your local mixed choir a try? 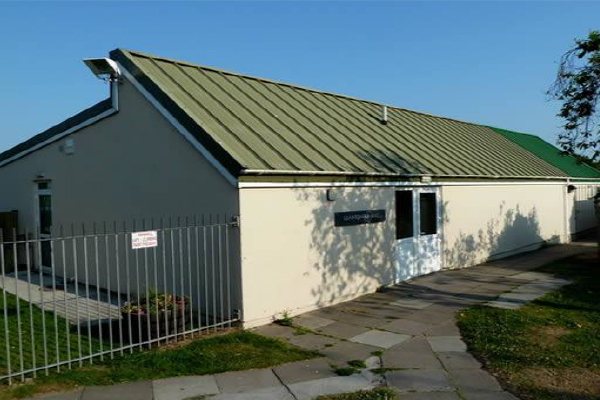 Barry Community Choir is holding a recruitment event hoping to attract male and female members on Thursday June 7th, 7.30pm @ Coffee Cove, Barry Island. Pop along for a coffee or a glass of wine, meet the choir and maybe even have a singalong. 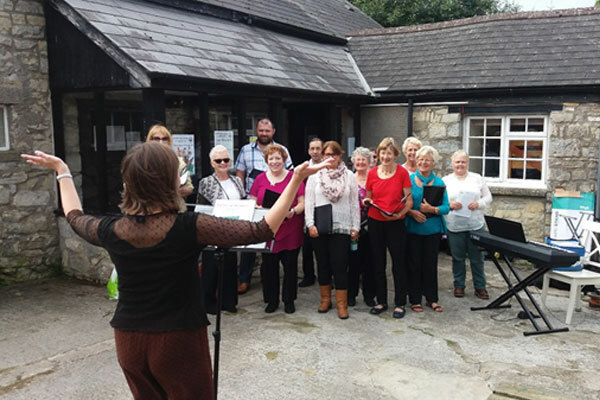 Singing in a group is hugely uplifting and can benefit your mental health and wellbeing. So, don’t be shy, give it a go Jo, bring your voice Joyce and don’t save your singing for the car. Mayor of Barry’s Christmas Carol Concert. 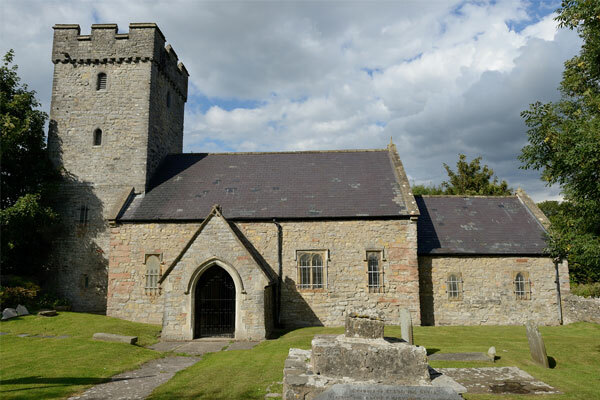 The Choir was invited to sing at the first Christmas Carol Concert to be held at this delightful, intimate chapel. A brass band under the direction of Dr Haydn Jones of Dinas Powys also performed from its own repertoire. The Choir sang from its Christmas repertoire, accompanied by Chris Fossey and the audience joined in with well-known carols led by the Choir and brass band. Everyone was treated to mulled wine and mince pies after the event – which were very well received. 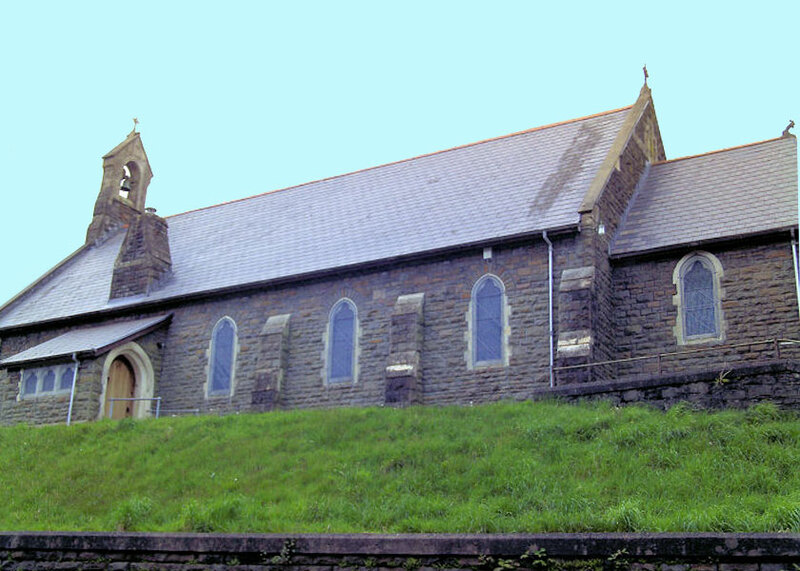 Proceeds from the concert went to Ty Hafan and the British Heart Foundation. We hope this will become an annual event. Mayor of the vale of Glamorgan’s coffee morning​. The Choir was invited to sing at a Christmas-themed coffee morning to raise funds for the Mayor’s charities. The Choir sang from its Christmas repertoire and also Christmas-sy songs, directed by Sian Davies and accompanied by Chris Fossey. The event was very well attended and the craft tables, games and refreshments were excellent and enjoyed by an appreciative audience. Many thanks to the organisers for such a warm welcome. Sunday, 10th December 2017 – 3pm. Come and “jingle” with us for a great start to Christmas. We will be singing songs old and new, with some favourites for you to join in with. 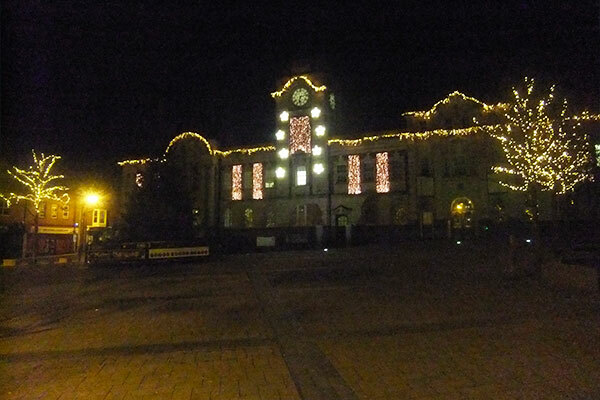 A wonderful way to get into the Christmas spirit, in an atmosphere of fun and friendliness. 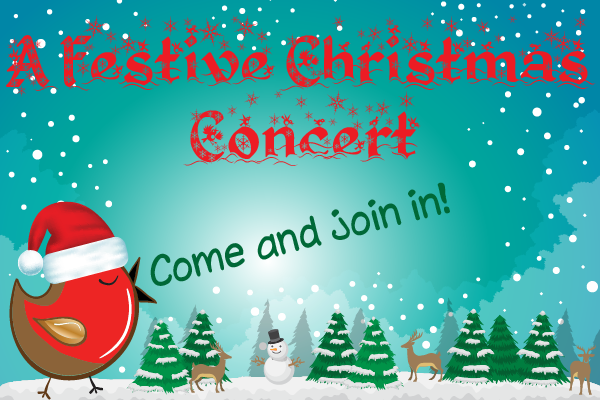 Tickets - £7 - are available from choir members, through the website and on the door and include festive refreshments! There will also be a grand raffle and a programme prize. Tuesday, 26th September 2017 at 7.30pm. 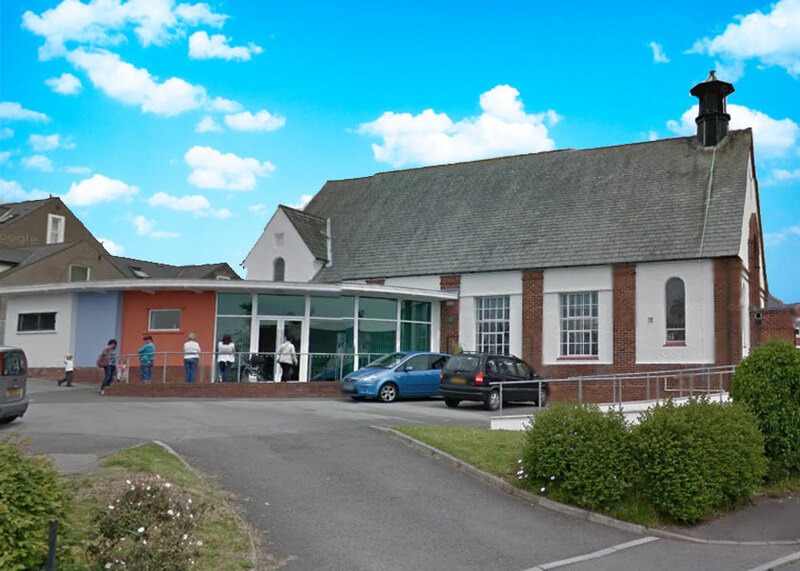 The Choir is delighted to be returning to the Hall and will be singing a variety of music from its extensive repertoire to entertain members of Llantwit Major Pensioners’ Club. Saturday, 23rd September 2017 – 12 mid-day. The Choir is delighted to be joining other groups to help Party on the Square go with a swing! We will be performing inside the Library around 12 mid-day. Entry to all events is free and entertainment is due to take place all day. Come and join in the festivities and help raise awareness of our wonderful local shopping opportunities. Friday, 22nd September 2017 – 7.30pm. Parish of St Andrew Major Church Lighting Appeal. Accompanist and Soloist Chris Fossey. 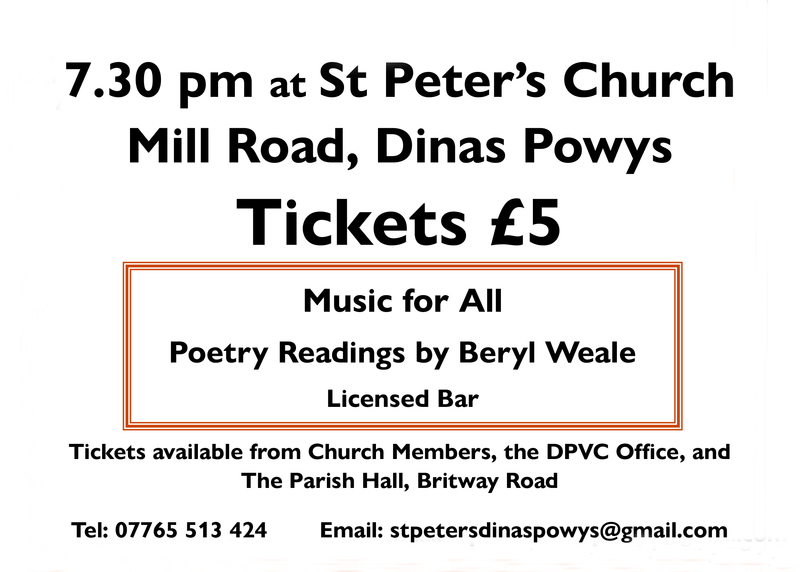 Poetry reading by Beryl Weale. Jane Hutt invites you to a community celebration. A great event coming up! 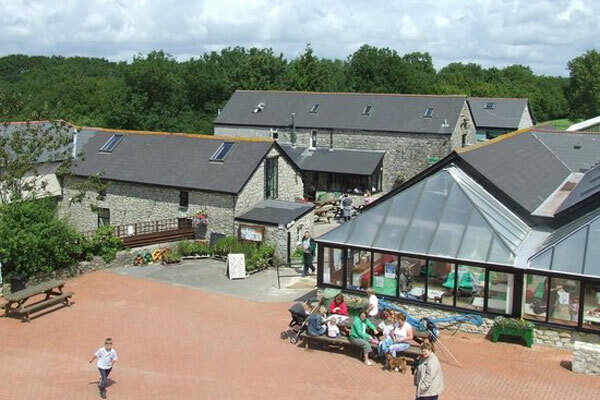 The Academy Café in The Pump House, Barry is the place to be on Saturday, 17th June from 2pm. 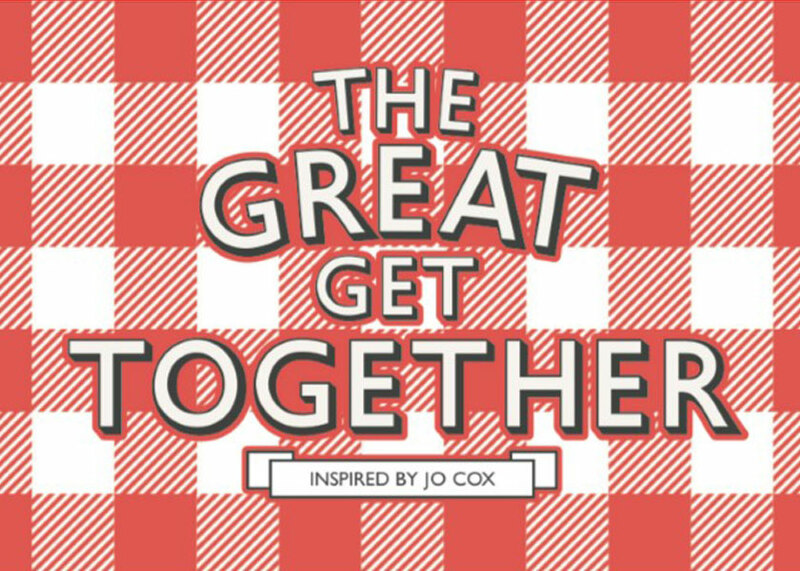 A "Great Get Together" organised by Jane Hutt and inspired by Jo Cox will see the Choir and two other local choirs singing their socks off. Come and join in - or sit back and watch - and enjoy a cuppa at the same time. 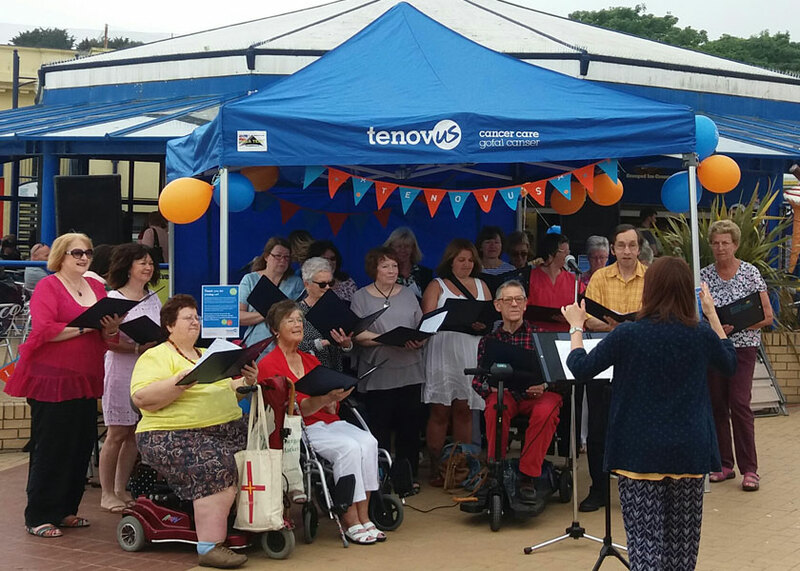 On Bank Holiday Monday, the Choir supported the Tenovus “Singathon” on Barry Island by opening the event with an offering of 7 songs, including the much-loved “Fields of Gold” and a new arrangement of “You’ve Got a Friend” with which the appreciative audience joined in. 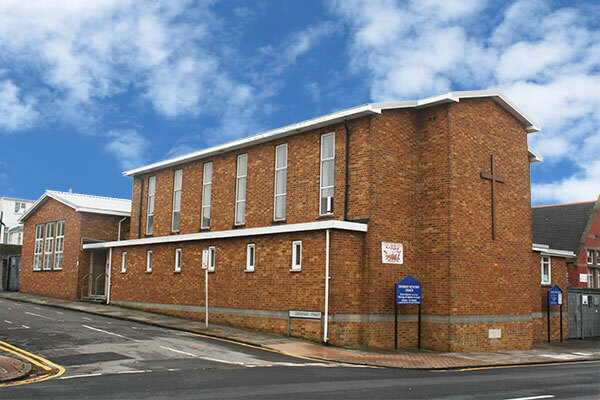 The Choir meets every Wednesday evening from 7.30pm at Crossway Methodist Church, Barry and our doors are always open to anyone interested in singing for pleasure. We are well-known for entertaining in care homes, residential homes and to various local groups and look forward to continuing this during 2017. 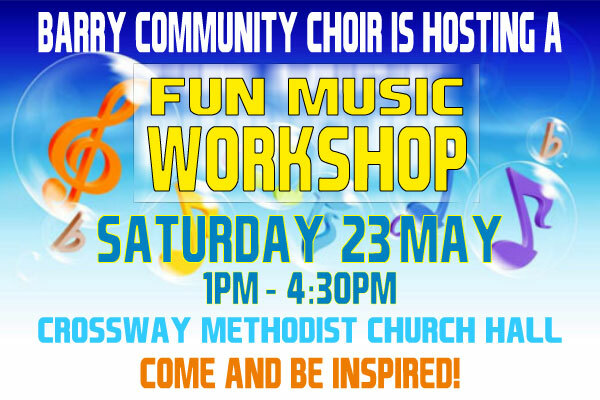 If you would like to join us or would like us to sing for you, please contact us via our contact page, Facebook: Barry Community Choir, or telephone 01446 748724. 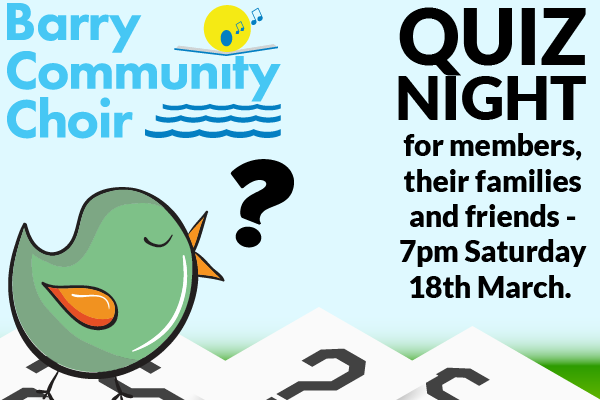 We are holding a Quiz Night for members, their families and friends on Saturday, 18th March the fun starts at 7pm. There will also be refreshments and a raffle. Tickets for the quiz are £3. Win, lose or draw, it's unquestionably a fun way to spend your Saturday evening!! Pop along, join in and tax that grey matter. During our concert, we will be entertained with duets from Emma and Sian, who have created their own inimitable style! Come and see us - Come and join in - Come and sing! Come and join us – a warm welcome awaits you. Shake off the cold and wet and join with the staff, patrons and choir at Habanas for a rousing session of carol singing and other Christmassy items from the Choir. Surely after a few bevvies from the well-stocked bar, we should all be in good voice and definitely good cheer! The Choir sang during the morning for a very appreciative audience. The Coffee Morning was a great success, raising over a thousand pounds at the last count. This was the first time that the Choir had performed in the building and it certainly won’t be the last. 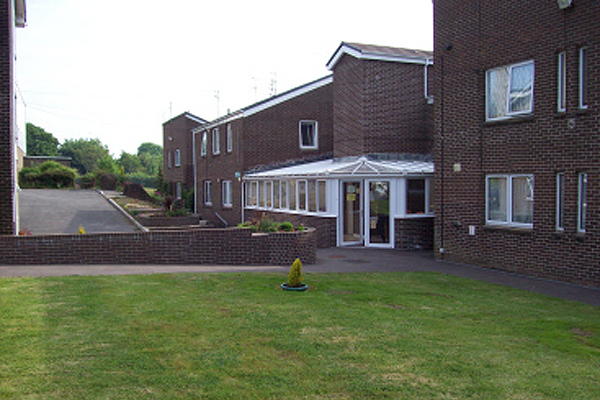 The staff, volunteers and residents were very welcoming and we felt at home straight away. Of course, the added bonus of a multitude of cakes plus tea and coffee helped enormously! We look forward very much to performing at the Centre again. On Saturday, 10th September, the Choir entertained during the Harvest Festival, singing a wide variety of songs from its extensive repertoire. The conditions were not ideal – it had rained the night before and was very windy on the day, however, the welcome was as warm as ever at this Vale of Glamorgan Gem. We are delighted to be singing during the Trust Christmas Fayre being held at Cottrell Park on Saturday, 19th November. 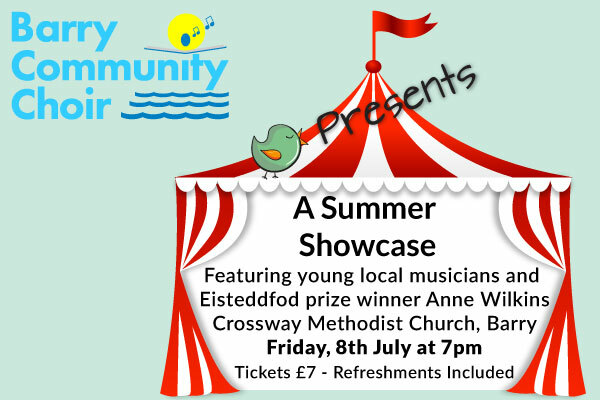 Join the Choir and talented local youngsters for an exciting and varied evening of music. We are also joined by Eisteddfod prize-winner, Anne Wilkins who makes a welcome return to Barry. Experience a kaleidoscope of music and help give our young people the platform they deserve. Tickets can be booked in advance or purchased on the door and are priced at £7 which includes refreshments. There will also be a grand raffle. So - don’t miss out on the fun – come and listen to tomorrow’s stars! Get your diaries out and put Friday, 8th July at 7pm in big letters - for a night to remember! The Choir has been invited to sing at the Spring Fair and is delighted to do so for the very first time. We will be singing in the afternoon, around 1.30. 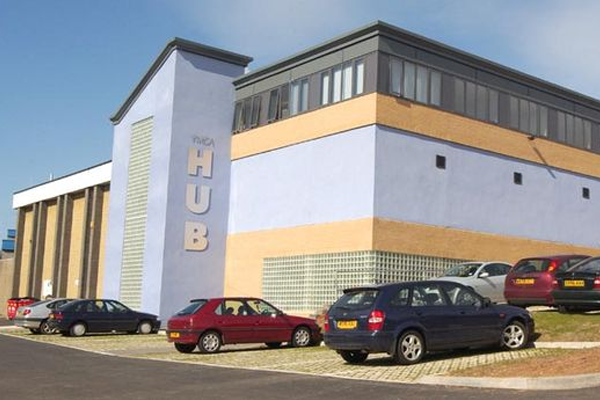 We would also be delighted to see our many friends and family members at this event which supports and showcases the valuable work done at the Trust. Whatever the weather, the Fair will still go ahead – and we will still be singing!!! - See you there! 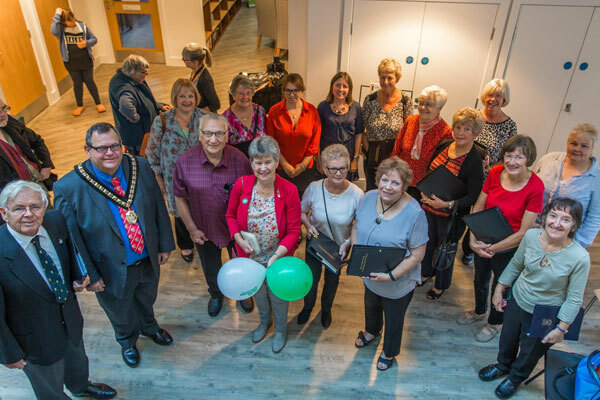 The Choir will be presenting a varied repertoire of songs to the group as part of its mission to take music into the community and entertain groups, clubs etc. - people that may not be able to get out and attend concerts. 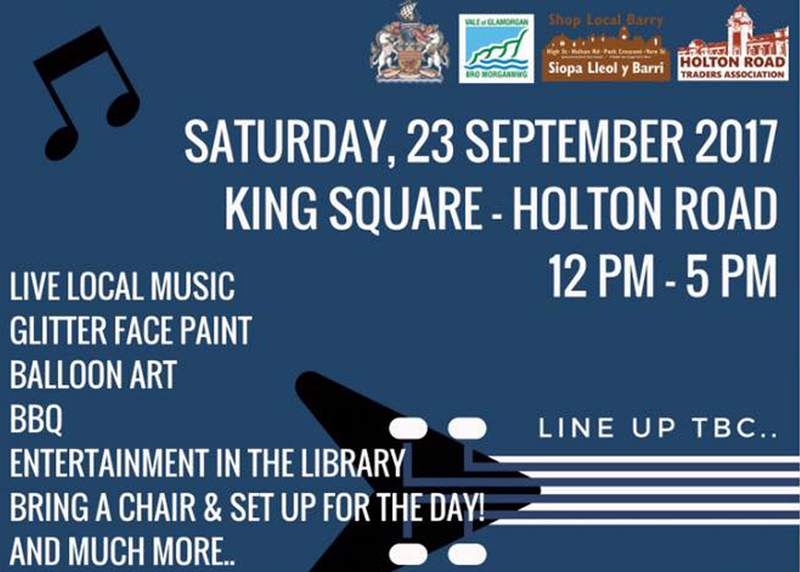 Bring your friends and family to this great event – which as well as being thoroughly enjoyable, will help raise funds towards the Mayor’s charities – Ty Hapus and MNDA Cardiff and the Vale. Wednesday, 24th February, 2016 at 2.30pm. 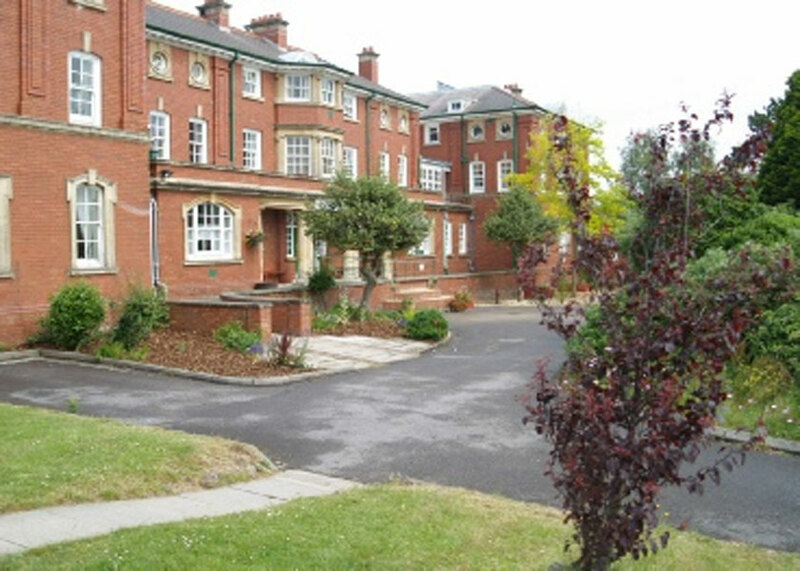 The Choir, under the expert direction of Emma Arscott, will be singing a wide variety of music to the residents and staff of Bethel House – part of Hebron Hall in Dinas Powys. 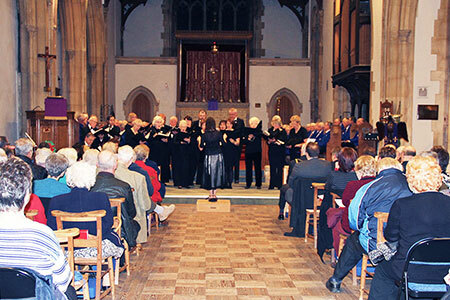 This event is continuing one of the Choir’s ambitions - to bring music to the local community, especially those people who find it difficult to come to our concerts. Come in from the cold and join us for our Christmas celebrations. Sing carols with us as well as listening to the Choir’s new Christmas music and some older, well-loved favourites. We will be joined by Jack Ollier, a local young lad with an amazing talent. He will be playing the piano, clarinet and recorder. Emma (Conductor) and Sian (Accompanist) will also entertain us with a duet or two. Tickets for this Christmas feast are only £7 – available from Choir members, Harmony Furnishings and on the door. There will be a grand raffle and refreshments are also included in the ticket price. What’s not to like?? £6.00 per ticket includes refreshments. Songs will include California Dreaming which was sung by the Mamas and Papas (arranged by Roger Emerson) and The Seal Lullaby (Eric Whitacre). £10 per person - Includes refreshments. We are a mixed choir so all are welcome including children over the age of 12. Vale of Glamorgan. CF63 4ER.